"Last night, the voters of Washington state broke the rule. They adopted by a nearly 60 percent margin Initiative 594, a measure extending background checks to all weapons sales and transfers, with exceptions only for transfers between family members and temporary loans for sporting or self-defense purposes. The passage of 594 takes on extra meaning because Washington state was the place where the gun lobby scored the electoral victory that supposedly proved its invincibility, the defeat of House Speaker Thomas Foley in his own district in 1994. Foley, a longtime supporter of gun rights, had helped pass two gun restrictions in 1993 and 1994: the Brady Bill restricting some handgun sales and the temporary assault-weapons ban, the latter inspired by a gun massacre at Spokane’s Air Force base that killed four and wounded 23. Then-NRA President Charlton Heston came to Foley’s district to campaign against him. Foley’s defeat seemed to prove forever the invincibility of the pro-gun cause. Yet even as politicians learned always to yield to the NRA, polls continued to show broad public support for many gun-safety measures, especially including background checks to deny firearms to felons, the mentally ill, and domestic abusers. Initiative 594 discovered a way to transform that support into a political fact. It bypassed the state legislature to lay a gun-control measure directly before the voting public. Yesterday’s vote confirmed: The polls were right. If you ask them, the voters will approve gun restrictions." But all is not futile. Washington State just broke the pattern. More than a week ago, four students, including the shooter, were killed in a high school north of Seattle. And in Tuesday’s election, voters approved of a ballot measure that is designed to keep felons, the mentally ill, people under certain kinds of restraining orders and others from buying weapons through unlicensed dealers — mainly gun shows and through the Internet. Would this measure, Initiative 594, have prevented a 14-year-old from murdering his classmates? No, given the circumstances of the Marysville-Pilchuck shooting. But it’s likely to limit other mass killings, or at least make it much harder for unstable people to get guns. Politically, this issue is a no-brainer, and shows both how broken the current American legislative system is and how to get around the politicians owned by the gun manufacturers. Universal background checks are supported by 92 percent of voters, and a nearly equal percentage of gun owners, according to Quinnipiac Poll this year. Republicans and independents — same sentiment. If ever there was an issue that demonstrates how the will of the people can be stifled by an uncompromising minority, this is it. What passed in Washington is not gun control. Nominally sane people can still stock up on insane quantities of firearms, including assault weapons. All this measure does is try to filter out the people who should not be waving weapons of mass carnage around in public. Brady President Dan Gross went on to say, “Today’s great success in Washington confirms what we already knew, that the American public, in every state of this nation, overwhelmingly supports expanding background checks to keep guns out of the hands of criminals and other dangerous people. Now we plan to keep building on this exciting momentum, taking this issue directly to voters in more states and showing the gun lobby ‘lap dogs’ in statehouses and Congress exactly where the American people stand.” Initiative 594 was the top electoral priority for the Brady Campaign and its Washington Chapters. 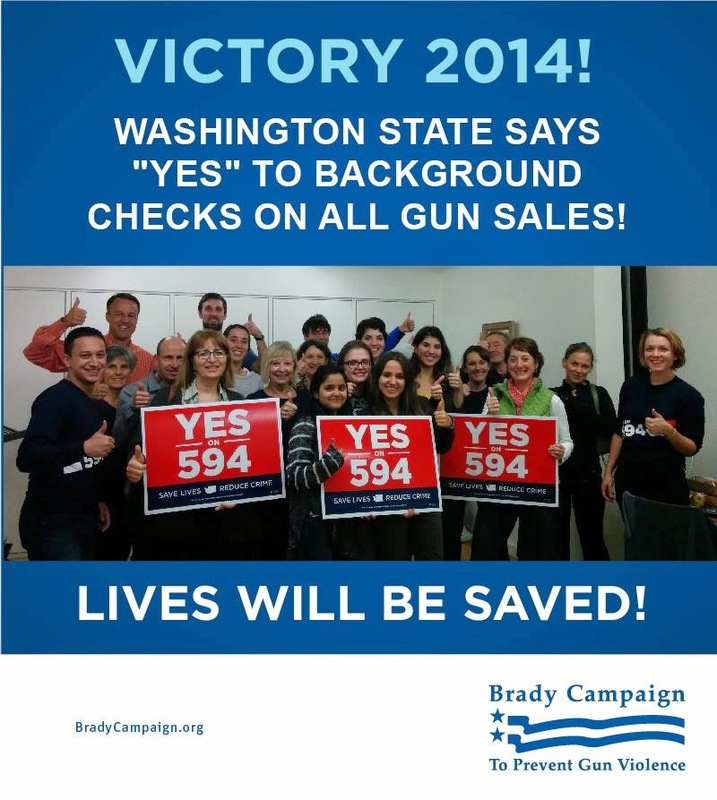 The Brady Campaign was pleased to partner with the Washington Alliance for Gun Responsibility, by placing thousands of calls to turn out voters and placing organizers on the ground to help achieve this monumental victory. Other victories came with candidates and incumbents who were elected even after they dared to talk common sense about guns and gun violence. One such was my own Congressman Rick Nolan whose opponent was the NRA's poster boy extraordinaire, Stewart Mills, heir to the family Fleet Farm business. Selling guns is a big business for them so naturally guns and gun rights were Mills' main talking point. I guess the public wanted more than gun talk. Others who won in spite of strong stands for common sense gun safety reform were the Governors of Colorado, Connecticut and New York. A new Governor elect Wolf of Pennsylvania believes in common sense as well. Senator Susan Collins of Maine and Jeanne Shaheen of New Hampshire voted for the Manchin Toomey bill and won their seats back. And some who ran away from the issue did not win anyway. Senator Kay Hagen, Senator Mark Pryor fit that category. 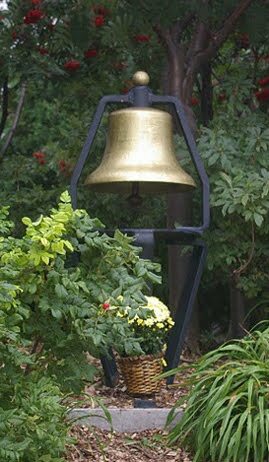 Had they voted in favor of the amendment, the least would be that they would have done something very good for the country after the Sandy Hook shooting and maybe have won. The same was true for some in state legislatures who ran away from the gun issue and lost anyway. Fearing the corporate gun lobby does no good for politicians. So why not speak up for public safety and save lives? Yes, I am aware that NRA endorsed candidates won. But in this election, the talk was different about guns and gun violence. Candidates are learning that speaking up is not a bad thing. Others should take note. Gun violence prevention organizations organized and spent more money than ever in the state of Washington. As I always say, follow the money. The corporate gun lobby has had the field to themselves. They no longer do. The American public wants gun safety reform. The issue will remain as an issue because every day, 80 Americans die from gunshot injuries. School shootings happen on a regular basis. Suicides take thousands of lives every month and small children manage to get access to loaded guns and shoot them accidentally, sometimes killing themselves or others. Domestic shootings happen regularly and "law abiding" gun owners will continue to be irresponsible with their guns and shoot them off accidentally or leave them around to be stolen or used by the wrong person. Until we get this right, we will be in the fight for common sense and doing the right thing. Lives depend on it so we have to get it right. We are better than this as a country. Let's get to work. This is worth noting. The Colorado Democrats won back two of the seats lost to Republicans in the recall after the state passed a gun safety reform bill. You can be a candidate who supports common sense and win.